Jack Charlton had just celebrated his first anniversary as Ireland manager when his team prepared to play Scotland in Glasgow in February 1987. Ireland had begun the qualification campaign with promise but there were still questions to be asked about Charlton and his ways. The home fixture against Scotland had been played in front of more than 49,000 at Lansdowne Road, a crowd boosted by the draw in Brussels in Ireland's opening game. In the Sunday Independent on the weekend before the game at Hampden Park, Seán Ryan asked three questions in a piece headlined 'Charton's way may be the only way'. "Is his selection policy the best one?" "Is he correct in ignoring League of Ireland players?" "Is he correct in insisting Paul McGrath should be used in midfield?" Eamon Dunphy on the facing page suggested that "if football really was a simple game, Scotland would be a good bet to win by two or three goals". But football wasn't a simple game. Ireland had injury problems, especially at full-back, but Dunphy concluded hopefully. "It is because of Charlton's personality that I think we will get a good result this week . . . Football is a complex game, as complex as the people who play it." Ireland had a squad made up of complex people but when Ronnie Whelan hears the team read out to him 27 years on, it is their greatness not their complexity that stands out. "That might possibly be the best Irish XI contained in one side," he said as he considered the team. Bonner, McGrath, McCarthy, Moran, Whelan, Houghton, Lawrenson, Brady, Galvin, Aldridge, Stapleton. Yet many were apprehensive as Ireland travelled to Glasgow. Scotland still had some of the old guard and they had a strikeforce of Mo Johnston and Brian McClair who had scored 57 goals between them that season, but they also had to deal with typical Scottish problems. "We always struggled in the European Championships," Maurice Malpas recalls. "I don't know if Scotland raised their game when it was the World Cup or if there was a hangover from World Cups when European campaigns began but we always found it more difficult." Scotland had returned home from another disappointing World Cup in 1986 and they were expected to beat Ireland at Hampden especially with their forwards in dynamic form. As ever, Ireland found goals harder to locate and the game would be an early example of the Charlton style and the values he expected from his side. There were 8,000 Irish supporters among the 45,081 in Hampden Park on February 18, 1987. In Ireland, counting was continuing following the general election held the day before but it looked as if Fianna Fáil and Charlie Haughey would be returning to power and forming a minority government. For some the game came as an opportunity. Whelan was worried that there would be no room for him in Charlton's strongest side. He had yet to start a game in the campaign and Charlton's preference for Paul McGrath in midfield alongside Liam Brady had left Whelan on the outside as Jack wasn't inclined to pick him in his club position on the left of midfield. Within six months, Whelan would have moved into a central position for Liverpool and his time would come in that role for Ireland but as the game in Scotland approached he could see no way in. "I was desperate to play but I didn't think that I would," Whelan recalls. Jim Beglin had his leg broken by Gary Stevens in the Merseyside derby earlier that month and with Chris Hughton also injured, Charlton had a problem at left-back. Ashley Grimes was called up the weekend before but the manager turned to Whelan and with McGrath moved to right back, in part to combat the danger from Davie Cooper, Ireland had a team of almost impossible strength. Within seven minutes they had the lead and it was thanks to typical canniness from Frank Stapleton and quick thinking from John Aldridge and Mark Lawrenson. 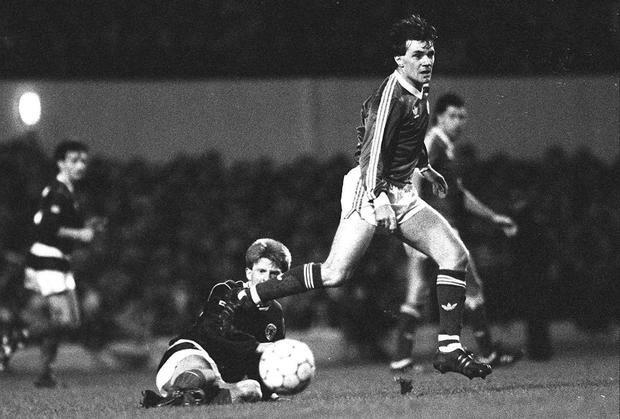 When a long ball came forwards, Stapleton jumped with Alan Hansen and Malpas. The two Scottish defenders collided but the Dutch referee awarded Ireland a free-kick. "Put it here, Aldo," Lawrenson screamed and as the TV cameras focused on Malpas lying on the ground, Aldridge played the ball into Lawrenson who capitalised on the fact that half the Scottish back four were disorientated to break through the middle of the defence and score. "The biggest shock was that Lawrenson scored," Malpas says as he remembers those moments. "Ireland took advantage but those things were far more common in the game back then." The reports at the time focused on Andy Roxburgh's displeasure at the goal but Malpas says it was never an issue for the players. "Not for one second did I think that Frank had tried to do me, there was far more contact back then. Every team had a big striker and every big striker was adept at using his arms and whatever he could to gain an advantage." Malpas accepted the challenge as typical for the times. As a full-back he was used to these tactics. "We always had one free tackle on our winger and you would try to rough them up." Whelan, meanwhile, was having what many regarded as his best game for Ireland who were looking for their first away win in a competitive game since they had beaten Iceland three and a half years earlier. There was one moment when Whelan felt it all unravelling. As Ireland withstood pressure in the second half, he gave the ball away with a pass he played straight into midfield. He knew enough about Charlton to know that this could be held against him forever. Scotland broke but Mick McCarthy cleared off the line from Ally McCoist. "I probably wouldn't have played again if they'd scored," Whelan says. Irish substitute John Byrne missed a chance for a second close to the end and McCarthy made another goal-line clearance but Ireland held on for a win that was seen, more in retrospect, as a message of intent. Charlton nursed a whisky during the post-match press conference and announced "the character in the team is there to be seen". Lawrenson said it could only be viewed as historic if Ireland went on to qualify. But things were already changing. When Ireland had drawn in Belgium thanks to a late Liam Brady penalty in Ireland's first game, Seán Ryan led the way down to the dressing-room after the game. It was customary for reporters to go in and talk to anyone they wanted after a match but Ryan found assistant manager Maurice Setters blocking the way. Ireland was still a relaxed and open camp but certain things were off limits in the new campaign. They were buoyant in Hampden while Andy Roxburgh's press conference lasted five sentences and he left the room with the words, "If anyone wants a further comment from me, I'll be in my office at ten tomorrow morning." If the result delighted the travelling supporters, the chances of it being viewed as historic by Lawrenson's definition faded over the next couple of months. Ireland lost in Sofia, although Charlton said he considered anything in Bulgaria a bonus after the win in Scotland. They then drew at home with Belgium in another scoreless draw. A crowd of 30,000 showed up to watch Ireland beat Brazil at the end of the season, a game which was notable in one other way. Whelan had established himself as a full-back but Charlton decided to play Chris Hughton in that game, only for Whelan to persuade him to stick with him. "It was the only time he changed his mind, I think," Whelan says. By the time Bulgaria arrived in October, the feeling was that this was another campaign that had promised much but hadn't delivered; 26,000 watched Ireland win 2-0 with Liam Brady magnificent. It was the same 11 who had started in Glasgow but they would never play together again. Brady was sent off six minutes from the end and then was ruled out of the European Championships with injury. Later that year, Lawrenson had to quit football with an achilles problem. Scotland had one more contribution to make to the history of Irish football. In November, they travelled to Sofia for a game that was expected to end in humiliation. "I ended up captaining the side because a lot of senior players were injured or unavailable for whatever reason," Malpas said. Bulgaria needed only a point to qualify and Ireland needed Scotland to win, something nobody expected them to do. "It was typical Scotland. When you think we'll do well, we struggle and when you think we're going to be beaten we pull it out of the bag," Malpas says. Three minutes from the end, substitute Gary Mackay picked up a pass from Steve Clarke, moved into the box and placed a left-shot past Borislav Mikhailov. Jack Charlton re-enacted his own version of The Likely Lads as he sat down to watch the game only to be congratulated on qualifying in a phone call which baffled him. "I said 'No, the match is on the telly, I'm watching it, it's 0-0 and there's only half an hour gone'," he would recall later. "And he said 'No, no, it's recorded, Scotland won 1-0 and this kid scored'." His caller explained the nature of it further and Charlton absorbed the news. Meanwhile in Sofia, the Scottish players were, according to Malpas, "high as kites" even if they had made things quite dark for their opponents. "The stadium was like a morgue," he says as Scotland celebrated a win which had more impact in Ireland than their own country. Malpas remembers one more thing. "They said Jack Charlton sent Andy Roxburgh a case of champagne. If he did, I never saw a drop of it."